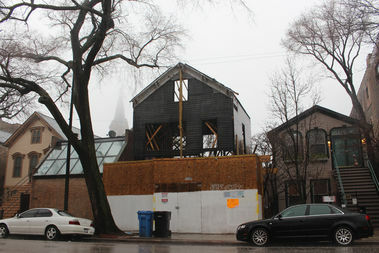 With the steeple of St. Michael's Roman Catholic Church in the background, the building at 1720 N. Sedgwick Ave. stands in the rain Thursday with no roof, no tarp and open walls. 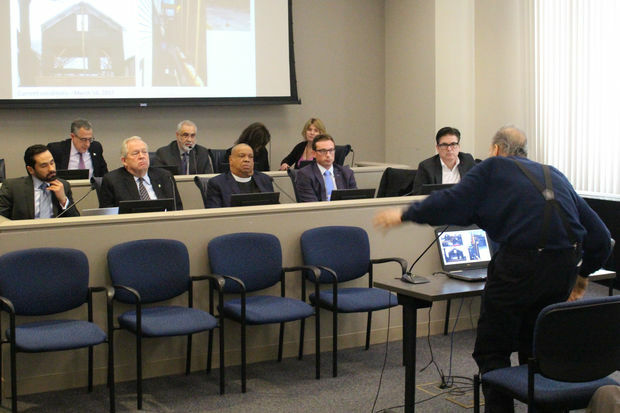 CITY HALL — Charges flew back and forth Thursday at an informational hearing before the Commission on Chicago Landmarks concerning a "rotted" 19th-century house protected within the Old Town Triangle Historic District. Ald. Michele Smith (43rd) led the way, accusing the owner of a controversial building at 1720 N. Sedgwick Ave. of reflecting "a disturbing trend ... to leave the properties without any maintenance essentially to try to allow the house to deteriorate and take the easy road to demolition." Smith charged that owner Joseph Younes "knew full well the condition of the building" when he took control of it in 2015 "and then took steps, we believe, to make it even worse." Owner Joseph Younes insisted he was not out to demolish the house at 1720 N. Sedgwick and that he is intent on restoring it. Smith was backed by commission staff architect Cynthia Roubik, who said Younes had gone beyond the scope of a building permit to fix the foundation late last year when the roof was removed and the building left exposed to the elements. But Younes disputed those claims. "The city has its view," he said. "There's always two sides to the story." Younes accused the previous owner of dragging out the sale for eight years and allowing the house to "deteriorate" and become rat-infested. He said he complained to Smith during that process "and she took no action whatsoever." Younes has previously insisted the building naturally "rotted" with age. Who should turn up at the hearing, however, but previous owner Richard Daniggelis. "Oh, I love this," he said. "I just love this." Maintaining that he was still the rightful owner of the building, Daniggelis said, "That house, every inch, is precious to me." Bought by his grandfather in 1911, it was the home the 78-year-old was brought home to as an infant. "It was fine. The roof was fine," he said. "That foundation was solid," he added, as it was poured by his father in 1960 with elements of steel mixed in. "I was evicted because of the falsification of documents," Daniggelis charged, adding that he was still pursuing the case in court. Commission Chairman Rafael Leon told Daniggelis he believed him, but that his claims were irrelevant to the matter before the commission, which was not scheduled to take any action regarding the house Thursday. Even so, the case laid out against Younes for violating protections within the Old Town Triangle Historic District had potentially dire consequences for him. Lisa Misher, of the city Law Department, acknowledged that "demolition by neglect" was a "tricker subject" to deal with than the norm legally, but said it left Younes open to fines of $1,000 a day and a moratorium on any new building on the property. Leon called the fine "pretty substantial." 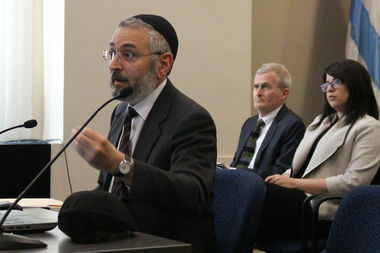 "The moratorium provision is very powerful," Misher added, in that the city could disallow any new construction on the property for five years if it were shown that Younes allowed it decay to the point where demolition was necessary. Ward Miller, executive director of Preservation Chicago, said the home should be preserved and restored, adding he fully supported the city and the commission in seeking to protect the house, built shortly after the Great Chicago Fire in 1871 as the city expanded north. Younes insisted he "didn't want to demolish the building, wanted to save the building." Granting that work had exceeded the permit as "an error on my contractor's part," he said, "The roof was falling apart" and that his contractor "took the initiative to take it down" and "remove a dangerous condition." "Everything that was done needed to be done," Younes said. "It's our intention to put the property back exactly the way it was before — exactly the way it was before." Daniggelis scoffed at that, calling the house's decay an "abomination" and saying, "He should be penalized $1,000 a day — at least!" The commission did not take any action Thursday, but the city has already had a temporary receiver appointed in court to take charge of the building and protect it as best as possible, and another court hearing on the matter is scheduled for April 27.